Kumihimo is the Japanese artform of braiding. The foam kumihimo disk is lightweight, and portable. Braiders can create complex braids up to 24 bobbins and incorporate beads. 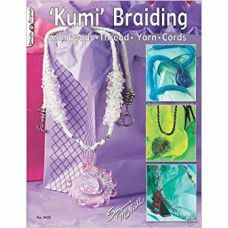 Kumihimo is usually done with rattail, but you can also use silk, hemp, cotton, and soft beading wire. Warning - once you start this is quite addictive!